What Is the GIANT Tenor Saxophone Mouthpiece? The GIANT series introduces a new concept in saxophone mouthpiece design that we call “Stealth Metal” combining the outside shape and look of a hard rubber mouthpiece with the precision of Aerospace Grade Hard Anodized Aluminum. The GIANT has a dark, big saxophone sound but with strong projection and cut. The JodyJazz GIANT is excellent for Jazz, Straight Ahead, Bebop, Big Band, even Rock, Funk, and Blues. Due to its versatility, it can blend nicely with a concert band or saxophone quartet. 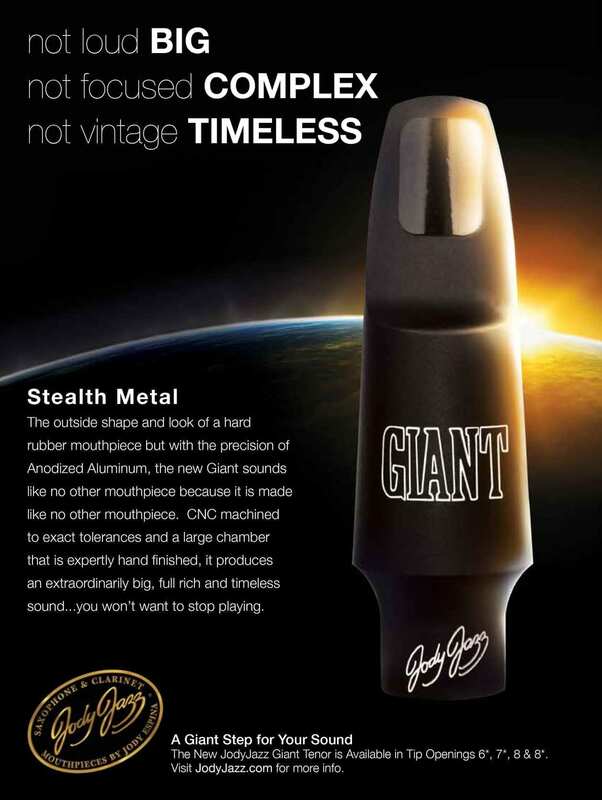 The GIANT is a great saxophone mouthpiece that seems to appeal to a very broad variety of players. Made on our five-axis CNC mill in our factory in Savannah. The Aerospace Grade Hard Anodized Aluminum provides the perfect tone and the ability to manufacture with extremely high tolerances. To capture the very best of our popular HR* hard rubber line of mouthpieces and then through 3D modeling take it to the next level. To create a tenor sax mouthpiece that is both warm and dark but with has a huge sound at the same time. To make a metal mouthpiece with the same cutting edge technology as our DV sax mouthpieces, but costs less to produce since we don’t 24kt Gold Plate the Hard Anodized Aluminum. To demand and achieve the most rigorous QUALITY CONTROL possible. Each mouthpiece is individually play tested by Jody Espina or one of our professional saxophonists on staff to insure a perfect seal with the reed and proper response throughout the range of the saxophone. 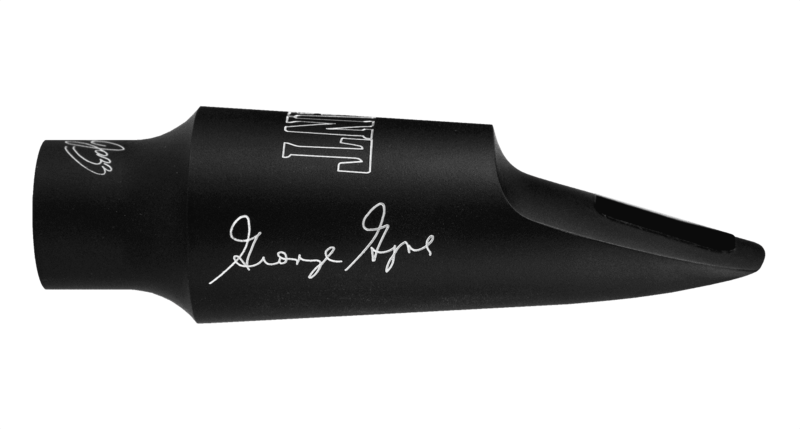 Unique Design - The unique inner and outer shape of the JodyJazz GIANT Tenor Saxophone Mouthpiece gives it a unique sound and feel. This is a unique chamber design. Hand Finished - Each GIANT mouthpiece is hand finished to ensure the absolute best quality and is individually play tested to ensure a perfect seal with the reed and proper response throughout the range of the saxophone. What Does The GIANT Do? How Does The GIANT Do It? The GIANT has a large chamber and a large sound. This tenor saxophone mouthpiece is somewhat unique in the fact that normally to get a lot of projection you have to have a smaller chamber, which gives you a brighter more cutting sound. And when a mouthpiece has a larger chamber the sound becomes warmer but the projection goes way down. Another way to say that is that large chamber saxophone mouthpieces are typically quieter. But the GIANT has a large chamber and huge warm sound due to the following unique factors that make up the GIANT: Material – Anodized Aluminum, Facing Curve – this is a brand new facing curve that allows maximum reed vibration, Baffle – this is the material inside the mouthpiece right next to the tip rail (extremely important for projection), Chamber Shape – The GIANT has its own unique chamber shape which is allowing warmth with projection. The GIANT produces a sound that has a core and more. There are many aspects to a saxophone sound and when we say a mouthpiece has a focused sound we mean that you hear more core to the sound than anything. The chamber and material combination of the GIANT are allowing it to create a sound that can be shaped by the player and ultimately have many interesting and complex aspects to the sound creating unique beauty to your saxophone sound. There are so many Jazz saxophone mouthpieces on the market today that are simply trying to recreate mouthpieces of the past. When making the GIANT we did not have this goal in mind although we think that those players wishing to evoke the sound of Classic Jazz mouthpieces should look at the GIANT. But rather we were trying to move into the future using state of the art manufacturing techniques, new material and new ideas to create a new Classic Jazz Sound. The GIANT has the outside shape and look of a hard rubber mouthpiece but the Anodized Aluminum material gives it the precision of a metal mouthpiece. CNC machined to exact tolerances. The large chamber is expertly hand finished to produce an extraordinarily full sound. The two newest additions to the GIANT Tenor range. Working with world-renown Tenor Saxophonist George Garzone, the company has developed the GIANT Tenor 9* and 10* models both of which will be launched as George Garzone “Signature” models. The main way this was accomplished was by using a facing curve that is similar to the curve on one of George Garzone’s old Hard Rubber Link 10* mouthpiece that he used to play many years ago. Essentially it is a shorter facing than you would expect on a large tip opening. Many people will doubt that they can play a 9* or a 10* but they are so often surprised that it does not require much more energy than their current 8* for example. We encourage you to try the Giant George Garzone Signature Model for yourself. "Dear Jody, I just wanna say how much I love your mouthpieces. I've been playing your mouthpieces for the last 5 years and you guys down do great work. I have both you Tenor classic, HR, and just recently the Giant. The Giant is some of your best work yet for me, its the mouthpiece I've been looking for. Thank you - William Hopkins"
"Jody, John and Danielle, Just one more email response and I will leave you guys alone. I played the GIANT 7* in rehearsal this evening. The blend was noticeably better in the ensemble, the intonation was exemplary at all volume levels and ranges, the response was immediate, and the dynamic range and tonal consistency were just plain fabulous. The piece is so much easier to control, and I am gonna love soloing with it as well. Most of all, quite simply, I absolutely love the sound of it with my Yanni 991. I am using VanDoren JaZZ 2.5 reeds. I could not be more pleased. The mp is everything that is described on your website, and now I sound like the demo by Arno Haas! Well, except that I cannot play as well. 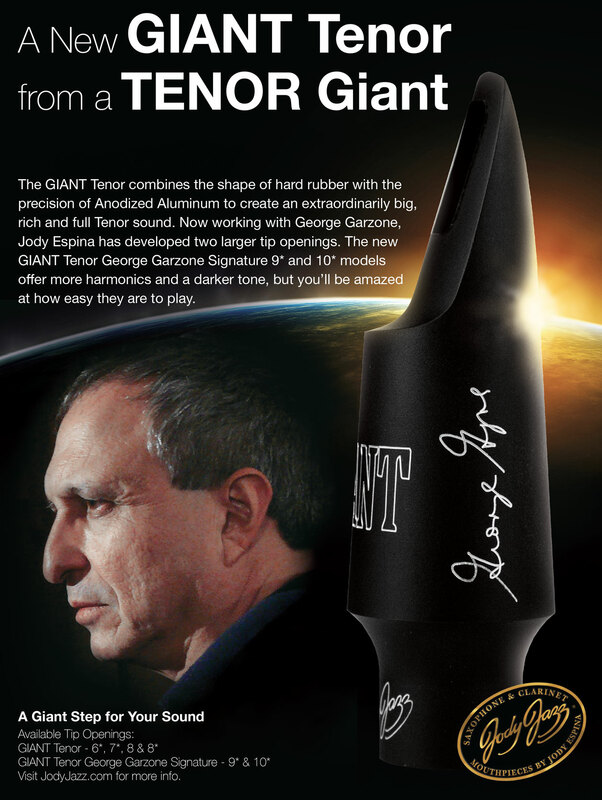 Best regards, Bruce "
"Greetings from Australia A thousand thank you's for your Giant tenor mouthpiece. It is quite simply awesome. After playing professionally for 35 years, i've pretty much played them all, and the Giant just blows my other pieces away. Don't get me wrong, my other pieces are great playing mouthpieces, but most of them really only do one thing. For me, the Giant does it all. Fat, rich sound for acoustic jazz, enough edge to cut through in an electric gig, and all with power to boot. Congratualtions on producing such a wonderful mouthpiece. Thanks again for the great mouthpiece. Best regards. Ralph Franke"
"The tone was very focused and with a little push sounded like an incredibly good metal Otto Link. The range of sounds the Giant can produce is remarkable. The Giant was absolutely stellar on the jazz gigs and held up quite well on the loud stuff considering it is not a "paint peeler" The response and tone were even in all registers, and articulation was nice and clean. And thats not all: The altissimo range absolutely killed. It's a truly unique product, combining elements of both hard-rubber and metal pieces in a way that could appeal to players of either camp. It plays like crazy. Whether you prefer hard-rubber or metal, check out the GIANT - there really is nothing else quite like it out there."